The Peace River Navigators again dominated the North West Junior Hockey League awards, four Navs took home hardware as voted on by the teams. Darcy Haugan was named the Coach of the Year for the third consecutive year. Dustin Long (#!8) received Rookie of the Year. 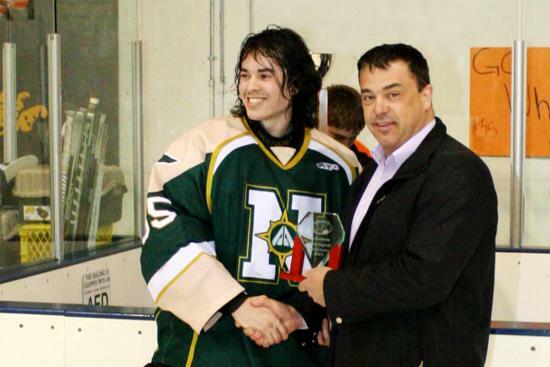 Kevin Monfette (#22) was picked as the Top Defenceman, also for his third consecutive year. And Patrick Earle (#1) was awarded Goaltender of the Year for his second consecutive year. 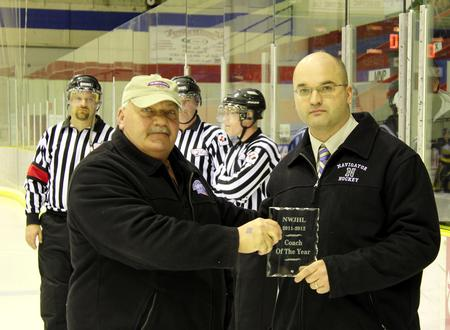 Darcy Haugan receives the NWJHL Coach of the Year award for the third consecutive year. 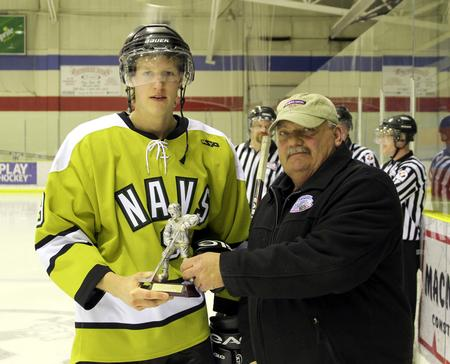 Kevin Monfette (#22) receives the NWJHL Top Defenseman Award for the 3rd consecutive year in a row. 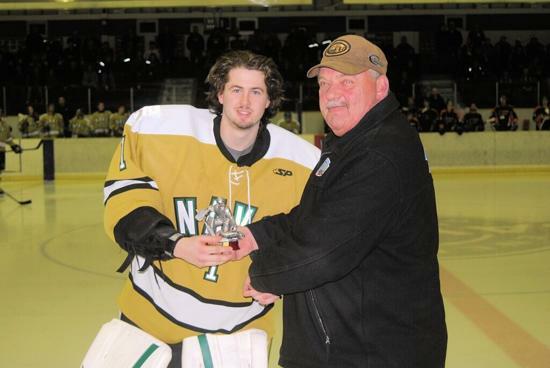 Patrick Earle (#1) receives the NWJHL Goaltender of the Year Award for the 2nd consecutive year. 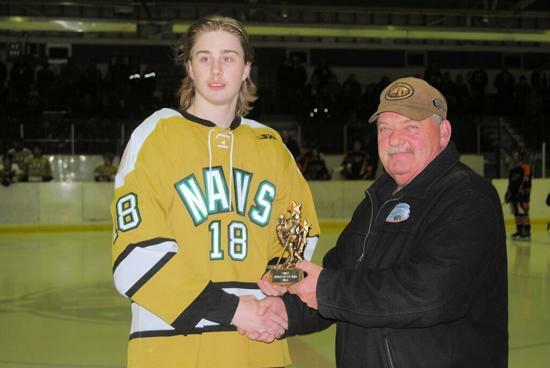 Dustin Long (#18) receives the NWJHL Rookie of the Year Award. The Peace River Navigators dominated the North West Junior Hockey League awards, four Navs took home hardware as voted on by the teams. Darcy Haugan was named the Coach of the Year. Forward Josh Peters (#9) was selected as the Most Gentlemanly Player. 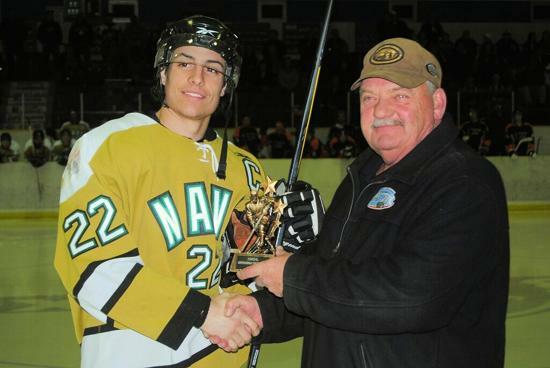 Kevin Monfette (#22) was picked as the Top Defenceman. #1 Patrick Earle was also awarded Goaltender of the Year. 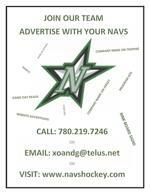 The trio has helped the Navs remain in first place from the first puck drop in September. At the February 24th game at the Baytex Centre in Peace River, the president of the NWJHL presented these players with their awards. The league's Most Valuable Player award was shared by two players - Nolan Trudeau of the Grande Prairie JDA Kings and Robbie Sidhu of the Fort St. John Huskies. Sidhu is the league scoring leader. Trudeau was one of two Kings to win an award. The other GP player recognized was Cory Wamsteeker, who was chosen as the league's Rookie of the Year. 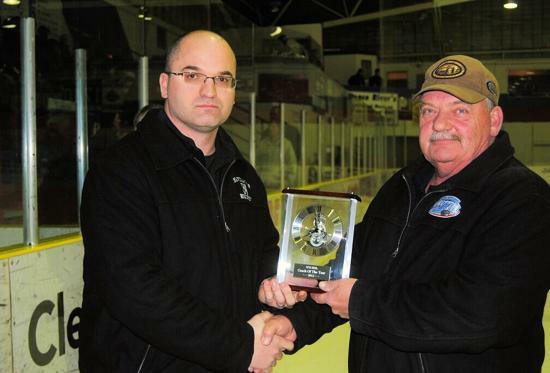 Darcy Haugan accepts the NWJHL Coach of the Year award for the second consecutive year. Photo by Jeff Blay. 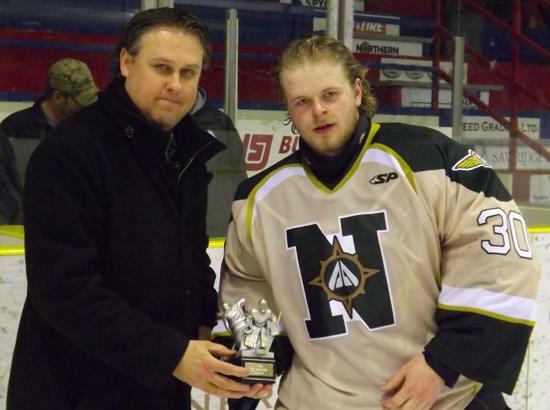 #1 Patrick Earle accepts his NWJHL Award for the Goaltender of the Year. Photo by Jeff Blay. 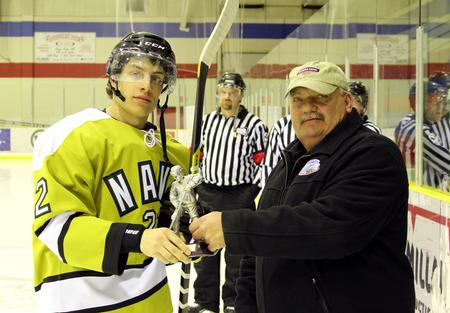 #22 Kevin Monfette accepts the NWJHL Best Defenseman of the Year award for the seond year in a row. Photo by Jeff Blay. 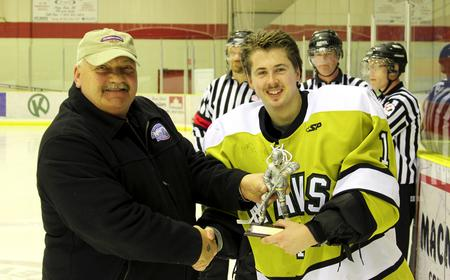 #9 Josh Peters accepts the NWJHL Most Gentlemanly Player Award for the 2nd consecutive year. Photo by Jeff Blay. Darcy Haugan was named the Coach of the Year. Forward Josh Peters (#9) was selected as the Most Gentlemanly Player & Rookie of the Year along with Brayden Glinnum of the Sexsmith Vipers. 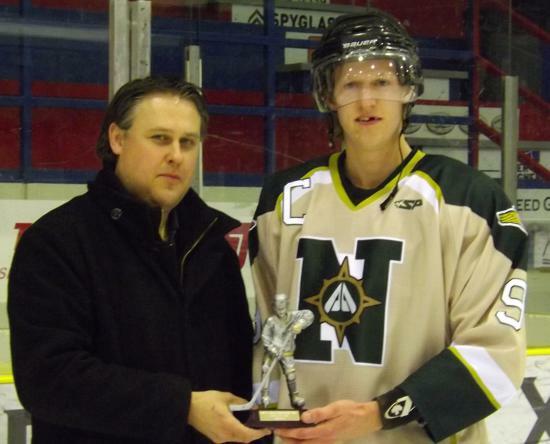 Kevin Monfette (#22) was picked as the Top Defenceman.